Get your hands on £5 Free Bets with England Specials every time that Roy Hodgson’s men win a match during Euro 2016. Place a £10 wager with the England Specials Offer on the Three Lions to win the tournament, and the online sportsbook will reward you with £5 Free Bets every time they win a game. The England Specials Bonus is only open to UK and Irish players who have received an invitation from the online sportsbook for this offer. The England Specials Offer runs until England reach the Quarter-Final stage of the Euros (provided they reach it) – this would be one of the following dates: June 30, July 1, July 2 or July 3. William Hill online sportsbook will reward you with £5 Free Bets every time England win a match, regardless of how they do it – 90 minutes, extra time or even on penalties. France 1.30 (3/10) kick off Euro 2016 against Romania 13.00 (12/1) on June 10, while England 1.91 (10/11) opens its campaign the following day against Russia 4.80 (19/5). Make sure you use the England Specials Offer with the online sportsbook before this match! The Three Lions 1.57 (4/7) will then take on Wales 6.50 (11/2) five days later, in what is looking to be a thrilling encounter. England’s 1.61 (8/13) final match will see them play Slovakia 5.00 (4/1) on June 20, which offers you the third chance to collect a £5 Free Bet with the England Specials Offer. William Hill online sportsbook favours Roy Hodgson’s men for all three games in Group B, which means that you can expect to get £15 in Free Bets with the England Specials Offer! And the further they reach in the tournament, the more you can Free Bets you’ll receive. Join the online sportsbook now and bet on the Euros with the England Specials Offer! 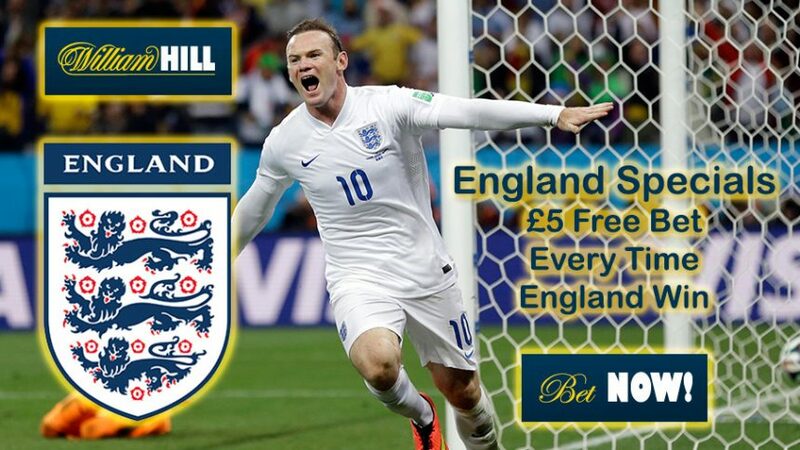 Get £5 Free Bets with England Specials!